Import cargo clearance in Thailand Customs. What is the customs process in Thailand to import? How is import cargo released from Thailand Customs to importer? Who are the parties involved in import customs clearance formalities in Thailand? 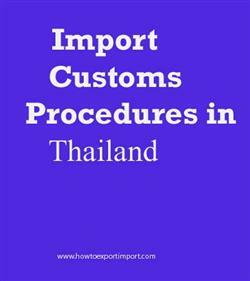 The information provided here details on how to import goods to Thailand especially import customs clearance procedures in Thailand. The official customs authority of Thailand is Thai Customs. All goods imported into Thailand must be reported to the Customs department. The Thai Customs implemented a new generation of Customs computer automation system known as "e-Customs". The trader should register to use e-Customs system. For registering in this system, the importer should have a ‘digital certificate’. The digital certificate is an electronic signature file used to affirm the identity and genuineness of the sender of electronic documents and it is fundamental for all organizations in Thailand with any online activities, including import and export registration. This e-Customs system provides a one-stop service for all stakeholders in international trade. Procedures such as issuing licenses and paying duties and taxes, cargo control, goods declaration processing, have been made paperless and can be completed using the central e-Customs system. The "e-Customs" comprising of e-Import, e-Export, e-Manifest, e-Payment, and e-Warehouse. Requirements of customs to import to Ko Samui. Customs requirements in Udon Thani to import. Customs needed to import to Surat Thani Province. How can I clear customs to import in Phuket Province. What Customs formalities required to import in Krabi. What should I do to import goods in Hat Yai. How to get import customs permission in Rayong and Pattaya. Procedure to get customs clearance to import in Chiang Rai Province. Mandatory process need to complete import in Chiang Mai The way to get customs clearance process to import in BANGKOK. Import customs procedures required in Bangkok. Import Customs process in LAEM CHABANG. Process to import to SONGKHLA.